If you've ever considered a massage chair for your home or business, there might be a few doubts that immediately come to mind. Do I really need i? Is a massage chair an unnecessary luxury? Or you might think to add one to boost revenue and profits is out of reach due to initial cost and ongoing output. But you might reconsider once you know the benefits. 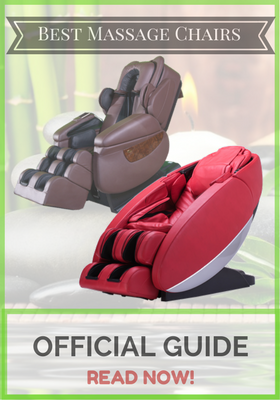 Great place to start is by looking into extensive lineup of human touch massage chairs. We've looked at all five Human Touch massage chair product lines, and the models in each line, so you don't have to. Massage has scientifically proven time and again to relieve stress, boost circulation, improve your cardiovascular health, and boost your immune system. Can you put a price tag on your physical and emotional well-being? Not really. But even if hearing that makes you roll your eyes (I know. I hate when someone tells me I can't put a price on something, but my bank account begs to differ), plenty massage chairs are within reach monetarily and wildly beneficial. Similarly, if you're thinking of adding one or more to your business, it's worth running the numbers. Look at the long game, and you might be surprised at what you find. Think volume. Think wholesale. Think discounts. There are a few key players in the massage chair world, and Human Touch is among the best of the lot. If you think massage chair equals something that looks great in a salon or doctor's office, but isn't something that exactly "makes the room" in your house, check out this line. They're strikingly modern, aesthetically pleasing, and no one will know they're massage chairs. Just don't be surprised when your unsuspecting guests won't leave your house. These chairs are all about the back: improving posture and spinal health, and relieving pain. If you're a fan of midcentury modern furniture, and you happen to know your chair designers, think Eames. The PC 610 is a looker. Sure, it's a recliner and not a lounge chair + ottoman, but let's not quibble over details. It looks great, and it's designed for form over function, as things are supposed to be. These chairs are gorgeous. Also, if you're choosy, you're going to be happy with your options. You get to choose the color of not only the frame, the type of leather (premium, top grain, or soft), as well as the color (one to six options, depending on the grade you select). But enough about looks. This chair is recommended by doctors, as it employs zero gravity positioning, and you can choose your recline. All with the touch of a button. This model has everything the PC-610 has, but you use your weight to move the chair instead of a button. You know, like a traditional recliner. So, if you're looking to save a few dollars, and you don't mind merely using your body weight to incline the chair into a position that will instantly transport you to Shangri-La, happy birthday. If you lean towards minimalism and like a slightly smaller recliner with all the benefits, check this out. You get the same choices that you get with the 610 and 420 regarding frame, fabric, and colors, and you can adjust both the angle of recline and the height of your legs. Zero gravity positioning is a given. This recliner is designed for those who prefer some bulk to their furniture. It doesn't sport the modern aesthetic as much as convey strength and stability. It comes in top grain leather, and you can choose from three colors. 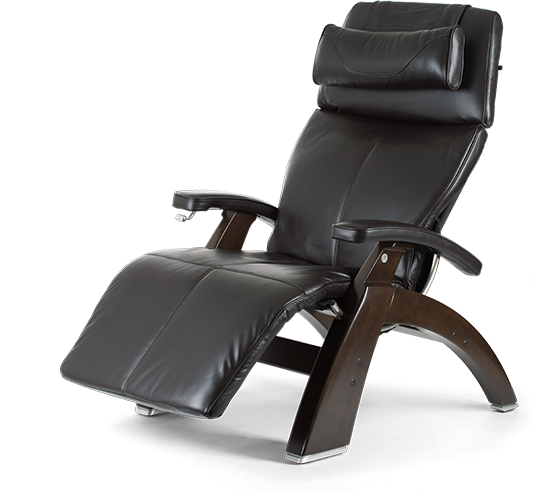 This is a recliner for someone who is all business when it comes to back health. Human Touch uses what they call ProZero mode for this chair, which goes beyond zero gravity for optimal stress relief and spinal health. It also reclines into more positions than other recliners on the market. Pure Zen. Tranquility is the perfect nomenclature here. 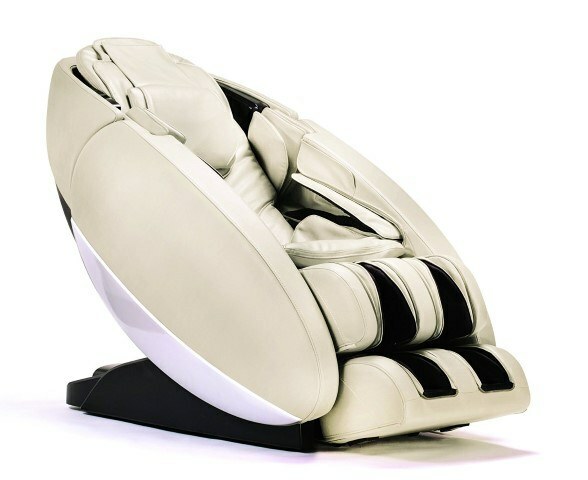 Human Touch designed this chair to transport your body and mind into a state of health and bliss. The recline sets your body completely neutral and takes all of the weight off your joints and bones. Jade stones, built into the chair, heat up and soothe muscles and relieve tension. Finally, waves of massage envelop the entirety of your body. Who are we kidding? This chair is beyond tranquil. This series is designed for the serious enthusiast or anyone seeking any level of relief from back, neck, hip, leg, or body stress or pain. And if you simply need the highest order of relaxation and muscle tension relief out there, look no further. If you've ever been, you can stop reading. HUman Touch Bali chair is all about massage, and no one on the island understands why anyone would stress about anything. It's a heavenly place. This chair lives up to the name and the outlook. It provides a very rigorous, so it's not for the faint of heart. Features include a rotating calf and foot massager built into the ottoman part of the recliner, which you control; a remote control that lights up (LED), so no turning on an overhead to disrupt your peaceful time; multiple shoulder settings, and original arm containers, rather than rests. Your arms are hugged in massage. There are nine height settings, the chair detects the length of your spine and back and adjusts accordingly. The cloud touch technology is placed at your arms, hips, seat, and shoulders, so you get the latest massage technology to every part of your body simultaneously. If you're an athlete or your job is particularly hard and demanding on your body, check out the Novo XT. It's built for you and your specific physical and emotional needs, before and after your muscles get a serious workout. This chair looks a little futuristic because it is. You can position the foot and calf massagers to suit your needs, and the foot rollers deliver expert-masseuse-level reflexology. The leg rest is automatic, adjusting to meet your exact height. The built-in Bluetooth speakers let you choose what type of music relaxes you, and the track (which they label unibody) covers more than sixty percent of your body, so this chair has you covered like no other. You get a heated lumbar for added stress and muscle tension relief in your lower back, where we need it most, and the chair is designed to stretch and bend your back and legs to relieve back pain and speed recovery. You can choose from thirty-four programs, and as always with Human Touch, you'll be supported in zero gravity positioning. 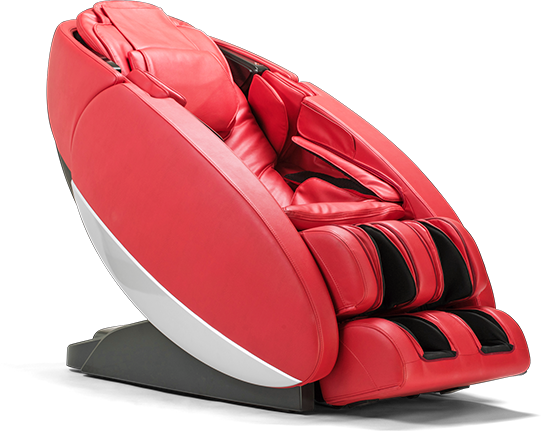 Delivering a vigorous level massage, the Accent Novo is built for over achievers. Like the XT, you get zero gravity design so your spine can recover and your hips and legs are weightless. It also comes with thirty-two programs to choose from, the signature sixty-percent unibody track, and a heated lower back area for lumbar support and relief. The leg rest extends to match your body, and the intensity of the foot and calf massage are up to your discretion. This sleep chair will not only aid you in getting a better night's sleep, but it will render your sleep more restorative. Like the Novo, but even better, this chair comes with thirty-six programs you can set for optimal wellness; arm hugging wells; and the classic zero gravity positioning. If you're a runner or weightlifter, you will rejoice in the calf massage feature; it provides a shiatsu massage as opposed to the standard air bag. You also get the acupoint scan to ensure the back options is tailored to your exact height, and cloud touch acupressure. The 4D body stretch is designed to pull and stretch your whole upper and lower body in a way that can't be achieved by stretching on your own. The rhythm massage feature utilizes 4D technology and employs robotics in multiple dimensions, delivering a deep tissue massage that is almost unheard of outside one you can get from a licensed masseuse. Control it all exactly to your liking with a remote. This line puts the "J" in joy in so many ways. Designed to look beautiful and incorporate seamlessly into your home, no matter your decor preference, these chairs are beautiful and unassumingly effective in delivering amazing massage. This little foot massager is as close as you can get to experience true, human-hand-reflexology. It is moderate in intensity level but is a sheer joy. 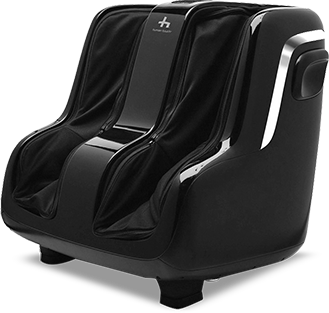 The massager employs robotics massage the feet, increase circulation, and relax the entire body. If you don't have a lot of extra space or you want a chair that fits where any other chair in your house would, the Active 2.0 is a solid bet. This is a classic chair, with three programs to choose from, and the circular massage you're used to receiving in the spa. If you're not happy with any of the three presets, you can mix and match to develop your customized massage. 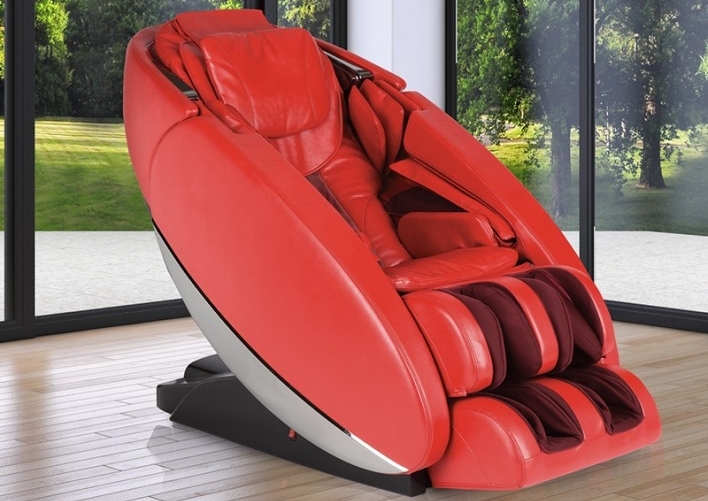 This chair is all about optimal relaxation. The massage level output is even labeled just that--relaxing. So, you're not running into vigorous or intense territory with this chair. Its baseline relaxation and stress relief, designed to help you feel more rejuvenated and less fatigue at the end of a hard day or week (or both). All you have to do is sit down, push a button, and you're on your way to maximum decompression. You have your own control set, so you decide what type you want, and bonus, this has a cup holder built right in. It comes with three programs, and an outlet is built in case you need to charge your phone while you relax. You control the intensity by removing (or not removing) the softening massage pad. Read our iJoy 2580 review here. Another entry-level chair, if you like things simple, have a tight budget, or want a little more out of your recliner, you absolutely can't go wrong with 2310. It's small in stature and ergonomically optimized. Another chair in the "relaxation" level class, it's got a controller stashed out of sight in the arm, a customizable intensity option with a removable pad, and three programs to choose from, featuring four different techniques. You can recline as little or as much as you want. Human Touch built a line of foot and calf massagers around the basic tenet that we all so often forget: our legs and fee carry us around all day. They work hard and get very little love. We should treat them well. Buy good shoes, and get a massage. Look no further than the CirQlation series. This foot and calf massager uses robotic technology to deliver it to your feet and calves that increases blood flow and circulation. It is delivered in a figure-eight pattern, targeting the power and healing that comes from foot reflexology massage. It adds kneading to the figure-eight pattern, which provides maximum relief to sore foot muscles. If you're on your feet all day or have a high impact job, this massager delivers comfort to your feet and calves in waves of de-stressing massage. The ottoman rotates, and you can move it around, so you can use it with your most comfortable chair (or in the office). You can also remove the sleeves and toss them in the washer. This foot and calf massager packs all of the punch of the CirQlation 2--rotating, independent ottoman, and kneading massage that reduces stress and increases blood flow and circulation. If you don't miss removable sleeves, check this one out. This one puts you in control with a console and two built-in auto programs. You get rollers under your feet for pain and soreness relief, and the figure-eight pattern of massage for increased circulation. You can also adjust the position of the massager, so it can tilt up as high or as low as you prefer, depending on the location of your body and chair you're sitting in. This foot and calf massager takes the thing up a notch. It's rated as intense level scale, and to the features that come standard with the 4, it adds heat. Your calves will receive a circulating-inducing figure-eight massage, and your feet a vibrating reflexology-based massage. If you're not quite the "intense" level type of person, the Pro has you covered. Comfortably (but not too comfortably) in the intense class, this massager delivers an excellent massage with all the wellness benefits--decreased stress, increased blood flow, and maximum rejuvenation. The Pro comes with warming technology for double duty relief, as well as the figure-eight and reflexology features. This vibrating and figure-eight pattern for your calves will leave your whole feeling refreshed and ready to take on whatever life throws at you. It also provides kneading, which aids in the recovery of sore, tired muscles, and increases circulation. This lightweight, portable foot massager delivers unparalleled foot reflexology massage that you can take with you wherever you want. It is an excellent add-on to the iJoy Active 2.0. This concludes iJoy chairs lineup. These chairs will refresh your body, invigorate your soul, and leave you pleasantly worry-free about your bank balance. At first blush, you might think they're like any ordinary recliner, but look again. They might look the part, but grab hold of the remote control, and your best recliner turns into instant massage therapy. And all the corresponding benefits are yours. Who has to know? Coming in at a moderate on the massage scale rating, the 7.1 mimics a circular massage you'd get from a salon or trained masseuse. You can retract or extend the ottoman for foot and calf, and the 3D flex guide delivers a smooth experience. You can pick from five preset programs, and the heated lumbar can give you extra relief on particularly lousy back days. The swivel base is a nice feature if you're not a fan of a single point of view chairs. This chair integrates zero gravity technology, relieving your joints from all weight bearing for maximum spine health. It too has a retractable foot and calf ottoman, and three presets to choose from. The flexguide 3D technology delivers a smooth, even massage, and you control the intensity in all areas of your back. This is what you call a smart chair. It runs a scan on your back, selects the areas in which you are most in need, and targets those. There are two separate heating modules for your back, so you can turn up the heat on your lumbar. The seat integrates pulsating massage in eight areas, including the dreaded and much-needed sciatica. There is a foot and calf massager that you can adjust or retract, and eight presets. The ZeroG is similar in design to the Perfect series. It's minimal, functional, and big on looks. 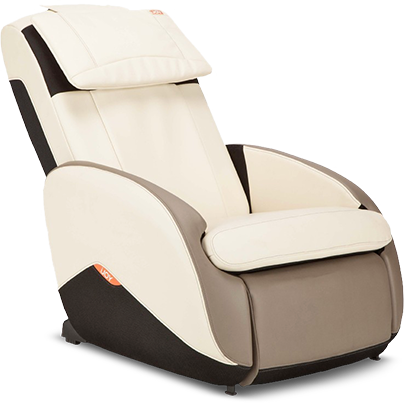 It allows you to recline to full weightlessness, comes in high-end leather, and delivers deep, healing, professional massage. There's a high-tech neck pillow that looks great and provides support for your head and neck, you can adjust the back and legs separately, and there is a built-in calf and foot massager in the ottoman. This is medical-grade chair. The system has four rollers, and it targets your whole body, low back to the neck. The calf and foot massager is adjustable width-wise, there are three preset programs, and you get the best of both massages: kneading as well as percussion, or tapping. If you need extra attention on your neck, you can remove the head pillow for more intensity. This chair is like a combination between a whole-body pillow and whole-body hug. You get a remote control, so you're in charge, and all you have to do is sink in, and let the healing begin. This one has cloud touch technology, which targets your hips, shoulders, arm, and seat; acupoint detection for spot-on targeted relief, a retractable and adjustable foot and calf massager, with removable sleeves for easy cleaning. They call this massage-delivery chair a smart 3D engine because it encompasses your body and moves in and around every muscle. You can choose where you want the pressure with your remote, or just pick one of the four programs. It comes with the fabulous calf and foot massager built into the ottoman, and of course, you can recline to absolute zero gravity. This chair gives you a whole lot of options. Choose from five different styles of massage, one or two heated back pads, and all stretch. You control the level and if you want feet and calves in the mix, just recline and enjoy the benefits of increased blood flow. This chair makes the decisions for you. Just enter the level you want, and the targeting system does the rest. The ergonomically optimized seat and zero gravity positioning enable you to be wholly weightless and supported. For full-body immersion, there is a foot and calf massager in the ottoman. This one looks the part. It's a sturdy chair, and its built to deliver maximum relief via moderate intensity. 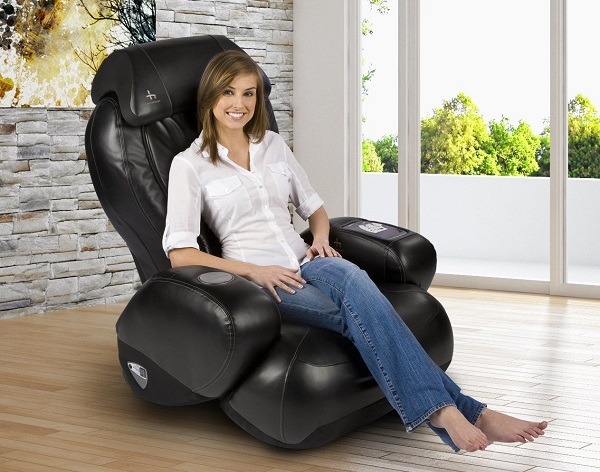 You can choose between five styles, and integrate your legs and feet with the ottoman massager. It combines a full body stretch for improved wellness and a boost to your immune and circulatory systems. The 5.1 delivers a superb relaxation massage. Also on the moderate level, the flexglide system ensures a smooth, soothing experience every time. There are three auto preset programs, and a retractable ottoman for a leg massage. This chair swivels, so you can recline and rotate as you wish, and the back and legs move independently so that you can adjust each to your exact specifications. This is an adaptable chair that will fit into any space. The ottoman is the width of the whole chair, so you get a full lower body massage. The flexguide technology in 3D targets your special-needs areas and delivers a soothing experience for optimal healing and wellness. There are four auto programs built in, and warming air on your lower back. You can go to zero gravity position by just pressing and holding a button to your exact desired angle. The recline feature is motor-driven, so you can get to any angle you choose via the control panel. The HT-3300 offer four massage techniques, and foot and calf massage. You can adjust the massage effect vertically, or pick a program that focuses on just one or more than one area at a time. This chair is indeed a masterpiece. Like your massage capsule of relief, this chair is hard to rival. The zero gravity feature is button-operated, and it detects your back and neck specific needs to tailor the massage. Lumbar heat and cloud touch technology stretch particular muscle groups. The built-in calf and foot massager provide vibrating rollers for your feet and compression for your calves. The sleeves are removable so you can wash them. You cab get it from Costco, E chair site, but most models available on Amazon. If you have any problem, it is an return process. All chairs come with a warranty (varies from model to model), so you covered for any repair or replacement parts. 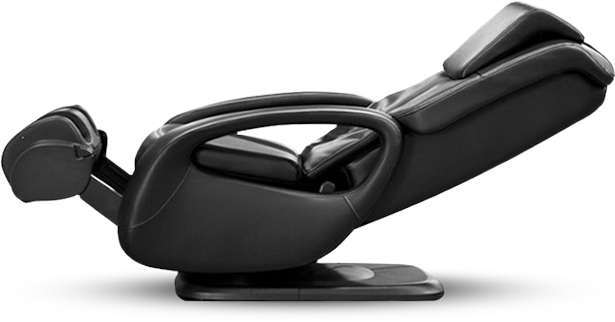 With many quality Human Touch massage chair models to choose from, HT offerings are a notch above the rest. And whether you're looking to enhance your physical and mental well-being at home or your bottom line at the office, there's an option that's right for you.